Our dreamtime is often the most productive time to gain new spiritual growth and understanding. Many people have psychic dreams that foretell the future, or that give guidance about career, home, and family. You can receive consistent and clear guidance while you sleep by inviting angels into your dreams. This is an especially good way to gain new understandings and creative ideas when your daytime thinking mode is locked into black-and-white viewpoints. While sleeping, we let go of rigid thought patterns. God and the angels can more easily transfer Divine ideas to us when we are open-minded, such as when we're asleep. Before going to bed, take a moment to meditate. Then affirm mentally or aloud: "Dear God and angels, Please enter my dreams tonight and give me guidance and new ideas about (fill in the blank with your specific request) situation. I ask that You help me to remember these ideas upon awakening clearly. Thank you and Amen." Even if you don't normally recall your dreams, this powerful affirmation will shift your consciousness so that you have powerfully vivid - and unforgettable - dreams during the hour immediately before awakening. We call these "lucid" dreams. They are like being in a movie, where you are simultaneously watching yourself and being the participant. It would be very difficult to forget these dreams. Even the person who swears, "I don't dream" remembers the plot and the message of lucid dreams. Many great inventions, books, and solutions were derived from dreams. You've likely heard stories of authors, business people, and inventors awakening with a lightbulb of an idea. Everyone has access to this pool of information, because everyone's mind is eternally joined with the infinite wisdom of God. You, too, can create in your sleep by setting your intentions before going to sleep. The angels can also heal limiting thoughts, beliefs, and emotions while we sleep. We've often read that faith is the substance of manifestation and miracles. In A Course in Miracles it says, "There is no problem in any situation that faith cannot solve." And a new scientific study found that people who believe in psychic phenomenon were more likely to experience accurate psychic guidance by a factor of one trillion to one, compared to skeptics. Dreamtime is an excellent platform for increasing our faith in the infallible order of the universe. One of the easiest ways I've found to increase the level of faith is by asking God and the angels to help. Even the most skeptical pragmatist will find that this method creates a powerfully impressive experience. An easy way to do this is right before going to sleep at night. Say this affirmation mentally or aloud, "Dear God and guardian angels, I ask you to enter my dreams tonight and clear away the fears that keep me from understanding, trusting, and following my Divine guidance. If there is a message you wish to give to me, please help me to understand clearly and remember it in the morning. Amen." Heaven will replace your distrust with faith, and you'll feel more confident about following your knowingness. We interact a lot with the angelic kingdom during our dreams. You'll increase your number of angel messages and the speed of your clearing work simply by inviting the angels into your dreams. For example, if you are undecided about your career direction, mentally say a prayer similar to this as you lay your head on your pillow: "Angels, please enter my dreams tonight and give me clear messages, that I will remember, to help me to know which direction to take with my career." They always meet this request, and you will likely have a lucid dream which you easily remember, in the hour right before you awaken. Or, the angels may help you in your sleep in such a way that you don't recall your dream's contents. Yet, you awaken and know that something shifted within you during the night. You feel happier, more positive, and much clearer about which direction to take. This is a sign that the angels have rearranged your thoughts and beliefs, to help you release fears that keep you indecisive about your career. If you feel blocked in any area of your life, write this message on a piece of paper and place it under your pillow. Repeat the phrase mentally three times as you are falling asleep: "Dearest Angels, I ask you to work with me in my sleep tonight, to clear away any blocks which keep me from fully enjoying my life. Please either call these blocks to my attention, or completely remove them from my mind, emotions, and body during tonight's sleep. Thank you." In the morning, you'll awaken refreshed but with an awareness that you've worked during the night. For more information please visit the www.AngelTherapy.com. You can also listen to Doreen’s live weekly radio show, and call her for a reading, by visiting www.HayHouseRadio.com - © 2015 Angel Therapy, Inc. All Rights Reserved. You sent the message at the right time. I LOVE YOU DOREEN !!! 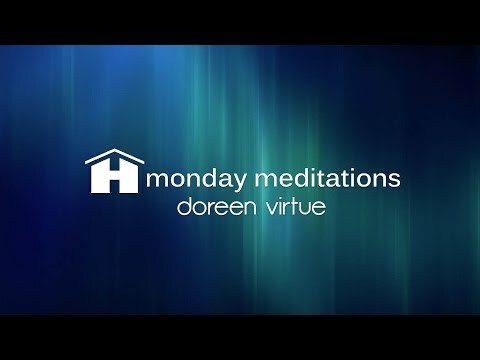 International best-selling author Doreen Virtue is a doctor of psychology and lifelong clairvoyant who has written extensively about angels, psychic development, and mind-body-spirit topics. Are You Going Through Life Changes Right Now?